The oldest Western Hemisphere regional group, which was formed to promote peace and collaboration among regional countries, is coming under increasing pressure to take more forceful action against Venezuela's Nicolas Maduro. The Washington-based Organization of American States, which marked its 70th anniversary of its founding last year, has yet to recognize Juan Guaido as the interim president of Venezuela or kick Maduro out of the group altogether. Guaido last week was recognized by the Trump administration and more than a dozen other countries as Venezuela's legitimate leader. The outspoken OAS Secretary-General Luis Almagro in mid-January publicly said Guaido is Venezuela's interim president "for a year" and called for an election so the opposition party in Venezuela could promote its candidates. Almagro made the statements spontaneously at a Jan. 15 event at the Washington-based Center for Strategic and International Studies. This past Tuesday, Gonzalo Koncke, Almagro's chief of staff, told Venezuelans in an interview on Fox News that "you're not alone; democracy will return the country. We have never been as close as now." In addition, a year ago the 35-member OAS passed a resolution objecting to "an alteration of the democratic state" in Venezuela, according to an OAS official. Critics, however, argue that Almagro's words ring hollow because he acted unilaterally in acknowledging Guaido. They point out that the organization remains deeply divided on the future of Venezuela and who should govern it. Some on the right are urging the OAS to reach out immediately and work closely with Guaido's designated OAS representative. "The interim president of Venezuela, Juan Guaido, has designated Dr. Gustavo Tarre as the country's permanent representative to the OAS," said Jason Poblete, a conservative international lawyer and expert in Latin American affairs. "The free people of Venezuela need a voice at the OAS." Another longtime conservative foreign policy hand who requested anonymity said OAS should recognize Guaido and "send a signal" to the new Venezuelan president that he needs to have the Maduro's Venezuelan delegation to the OAS exiled and "order it done." An OAS official countered that the organization has played a leading role in condemning the Maduro regime, with Almagro denouncing Maduro as a "dictator" three years ago. Almagro himself has received high marks from the right for voicing his strong condemnation of Maduro, but others complain that hasn't translated into change on the ground in Venezuela. 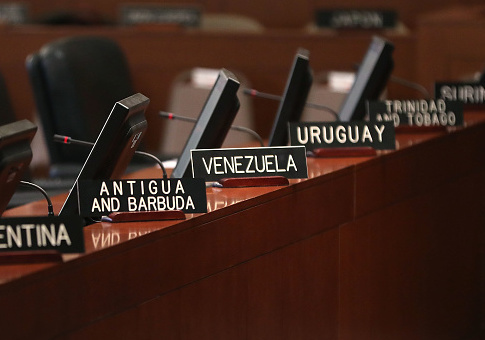 The Washington-based Inter-American Dialogue last March issued a scathing review of the OAS and Almagro's attempts to revamp the organization's ineffective structures, which is said often leads to deadlocks in policy. Maduro is often joined by leftist allies from member states such as Bolivia and Nicaragua, as well as many Caribbean nations that have received discounted oil from Caracas over the years. The regional powers were so concerned about the country's economic collapse in August 2017, they formed an alternative forum, known as the Lima Group, outside of OAS to try to address Venezuela's crises. The Lima Group is a multilateral body made up of 12 countries trying to find a peaceful exit to the crisis in Venezuela. The Lima Group, whose members largely do not recognize Maduro as the country's legitimate leader, plans to meet in Canada in early February to plot its next steps on Venezuela. The Inter-American Dialogue followed up on their report last fall by forming a Venezuela working group, consisting of prominent hemispheric leaders. Despite all the international attention on Guaido, the only issue on OAS's public agenda this week related to Venezuela is a forum dedicated to assessing a regional response for the flood of Venezuelan refugees into neighboring Colombia, Brazil, and Guyana. "The OAS tends to move slow and responds anemically to crises in the region," one expert told the Washington Free Beacon. "How long has Cuba been a totalitarian police state? Yes, the OAS, a body that was created to address those challenges, essentially punts or condones." In the last two weeks, the more divisive issue of Cuban intelligence and military officers' role in strengthening Maduro's grip on power also is proving difficult for the OAS to avoid. Sen. Marco Rubio (R., Fla.) on Thursday said Venezuelan military leaders are "trapped" by the powerful Cuban intelligence operative that dominate all levels of Maduro's government. "The question isn't whether top military leaders publicly support Maduro," Rubio tweeted. "After two decades of drug trafficking & constant monitoring by Cuban intelligence they are all trapped." "The real question is whether suffering mid-level officers and frontline soldiers follow their orders?" Last December he put it bluntly: "Both tragic & troubling to see how Maduro has allowed Cuban intelligence & security services to take over the government of #Venezuela." "A starving country is paying Cuba billions of dollars to help them repress their own people." Sen. Ted Cruz (R., Texas) has been so concerned about cooperation between the Maduro regime and Cuba's government that he filed an amendment to the defense authorization bill requiring the director of the Defense Intelligence Agency to submit a report to Congress on security cooperation between Russia, Cuba, Nicaragua, and Venezuela. A Cruz spokesman said Maduro's "thugs" use the intelligence cooperation to "keep themselves afloat despite impoverishing Venezuela and abusing human rights." "It would be in America's vital national interest to foil this corrupt relationship under any circumstances, but now that the Maduro regime has lost its last shred of legitimacy, our allies have an obligation to impose maximum diplomatic pressure—which includes taking action through the OAS," the spokesman said. John Bolton, the head of the National Security Council, was asked at a Monday White House press briefing whether reports of an estimated 25,000 Cuban officials and secret police in Venezuela constitutes a violation of the OAS charter that bars troops of another country from playing such an influential role in a sovereign country's internal affairs. "As you know, Secretary of State Pompeo addressed the OAS General Assembly a few days ago," Bolton responded. "We expect other meetings of the OAS—on this and related subjects—in the coming days, because both [Treasury] Secretary Mnuchin and I have said, we know what the legitimate government of Venezuela is and it's our mission now to make a fully reality in Venezuela what the people of Venezuela themselves want." Chapter IV and Article 21 of the OAS charter states: "The territory of a state is inviolable; it may not be the object, even temporarily, of military occupation or of other measures of force taken by another state, directly or indirectly, on any grounds whatsoever." "No territorial acquisitions or special advantages obtained either by force or by other means of coercion shall be recognized," it continues. Of course, the Cubans are in the country because the Maduro government and his predecessor Hugo Chavez welcomed them in with open arms. The opposition leaders, however, reject the Cubans' role and blame them at least in part for Maduro's ability to keep military leaders under his command despite spiraling inflation, people starving, and nationwide protests in the streets. This entry was posted in Issues and tagged Cuba, Drugs, Nicolas Maduro, Venezuela. Bookmark the permalink.